"Killing Me Softly with His Song" is a song composed by Charles Fox with lyrics by Norman Gimbel. The song was written in collaboration with Lori Lieberman, who recorded the song in late 1971. In 1973 it became a number-one hit, in US and Canada, for Roberta Flack, also reaching number six in the UK Singles Chart. The song has since been covered by numerous artists, including a version by the Fugees that won the 1997 Grammy for Best R&B Performance by a Duo or Group with Vocal. Displaying 1-5 of 5 items. 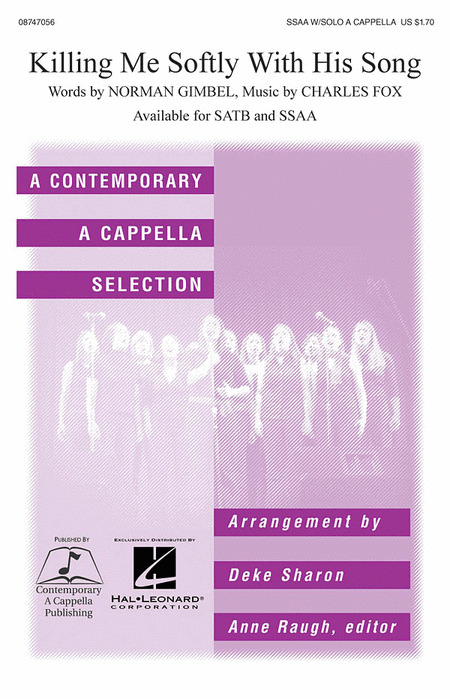 Deke Sharon has become one of the leading arranger of "contemporary" a cappella and here is a fine collection of classic pop songs. "Dancing Queen" - ABBA is back, so get some dancing shoes for your choir! Upbeat, infectious and fun, this arrangement will bring energy to singers and get audiences dancing in the aisles. "Killing Me Softly With His Song" was popularized by Roberta Flack in the 1970s, updated by the Fugees and Lauryn Hill in the 90s, this song connects with many generations. This arrangement provides a terrific vehicle to show off the talents of a sensitive female soloist. The modern day classic "True Colors" has been a huge hit for both Cyndi Lauper and Phil Collins. Now it's your turn! "Good Old A Cappella" was first performed by The Persuasions and popularized by The Nylons, this tune has been sung by countless contemporary a cappella groups. Originally from the collection Contemporary A Cappella Volume 1, now for treble voices too! "God Only Knows" with music by Brian Wilson, made popular by The Beach Boys in the '60s, this arrangement for women's choirs is a great one to feature your soprano soloist or section. "Hallelujah" - From the Dreamworks animated feature film "Shrek" comes this sweet and poignant Leonard Cohen hit, scored here for your women's group. Popularized by Nat King Cole, 'Orange Colored Sky,' from the Great American Songbook, provides an upbeat vehicle for either a baritone or alto soloist. Swing it! Popularized by Roberta Flack in the 1970s, updated by the Fugees and Lauryn Hill in the 90s, 'Killing Me Softly With His Song' connects with many generations. This arrangement provides a terrific vehicle to show off the talents of a sensitive female soloist. A perennial favorite of student a cappella groups since one-hit wonder Deep Blue Something charted in the 90s, 'Breakfast at Tiffany's' is finally available in published form. ABBA is back, so get some dancing shoes for your choir! Upbeat, infectious and fun, 'Dancing Queen' will bring energy to singers and get audiences dancing in the aisles. Yesterday and other Classic Pop Ballads is an absolute winner! Robert Latham's deft, skillful arrangements of some of the best-loved pop ballads of all time form an immensely rewarding collection for choirs in search of fresh 'a cappella' material. Whether you're a karaoke singer or preparing for an audition, the Pro Vocal series is for you. The book contains the lyrics, melody, and chord symbols for nine hit songs. The CD contains demos for listening and separate backing tracks so you can sing along. The CD is playable on any CD, but it is also enhanced for PC and Mac computer users so you can adjust the recording to any pitch without changing the tempo! Perfect for home rehearsal, parties, auditions, corporate events, and gigs without a backup band. The Vocal Sheet Music series is an exciting new series for singers, featuring authentic piano accompaniments and custom guitar chord diagrams, tailored to each song's unique chord progressions and designed to provide realistic support. 33 contemporary ballads are included in this volume. Create a smooth, sophisticated moment onstage with this setting of the 1974 #1 hit by Roberta Flack. Opening with a fresh and vibrant contemporary intro, the tune relaxes into a gentle bossa nova groove featuring the familiar lines of the female solo with rich vocal back-up harmonies. Available separately: SATB, SSA, ShowTrax CD. Rhythm parts available digitally (gtr, b, dm). Duration: ca. 3:55. Popularized by Roberta Flack in the 1970s, updated by the Fugees and Lauryn Hill in the 90s, this song connects with many generations. This arrangement provides a terrific vehicle to show off the talents of a sensitive female soloist.Available separately: SATB a cappella and SSAA a cappella. Performance Time: Approx. 4:50. Popularized by Roberta Flack in the 1970s, updated by the Fugees and Lauryn Hill in the 90s, this song connects with many generations. This arrangement provides a terrific vehicle to show off the talents of a sensitive female soloist.